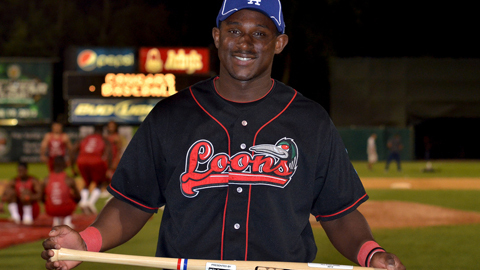 GENEVA, Ill. -- With his family watching from the stands, O'Koyea Dickson of the Great Lakes Loons wanted to put on a special performance Tuesday at the Midwest League All-Star Game. It didn't take him very long to make a statement. Dickson helped lead the charge as the East Division scored 13 times over the first two innings and coasted to an 18-2 thumping of the West Division All-Stars in front of 7,528 fans at Kane County's Fifth Third Field. Dickson went 2-for-3 with a two-run homer and two runs scored and was named Most Valuable Player. "My family has sacrificed so much for me, I just wanted to try, in any way, to pay them back," he said. "This is a milestone for me, just to be able to be here and be with these guys." Dickson's family surprised him with its arrival Monday night, and he was determined to return the favor. With a man on in the first inning, he blasted a 2-0 pitch from Drew Granier of the Burlington Bees off the scoreboard in left field. The home run wasn't in his plans, but the end result helped spark his team to a commanding lead. "I was just trying to hit a sac fly," Dickson said. "I've been working the past couple weeks, just trying to hit better with guys in scoring position." Gerson Montilla of the Silver Hawks also went deep in the opening inning and Tyler Goeddel of the Bowling Green Hot Rods added a two-run shot for the East. Steven Moya of the West Michigan Whitecaps and Fort Wayne TinCaps catcher Austin Hedges each had three RBIs. Fort Wayne's Adys Portillo picked up the win after working around a walk in a hitless first inning. Twelve East pitchers combined to scatter seven hits, with seven hurlers producing no-hit performances. "We said, "Hey, let's go and do it and have fun,'" Moya said. "That's exactly what we did." The East lineup gave its pitching staff a huge cushion early as Granier surrendered five runs -- two earned -- on three hits while retiring two batters. Peoria Chiefs left-hander Kyler Burke didn't fare much better, also giving up five runs and recording two outs. Ty Kelley of the Cedar Rapids Kernels was charged with three runs in two-thirds of an inning. The East added a run in the fourth and four in the ninth to round out the scoring. "In the locker room, everyone was just like, 'Go out and have fun and let's kick their butts,'" Dickson said. "We just tried to go out and swing it, and we showcased that in the first couple of innings." Jhon Goncalves of the Beloit Snappers provided the West's offense with an RBI single in the sixth inning. He later scored on a wild pitch by Great Lakes' Jarret Martin. The East's 18 runs were the most scored in Midwest League All-Star Game history, something Hedges attributed to his team's ability to gel almost instantly. With such a huge early lead, it took the pressure off his teammates, who were able to relax and take in their surroundings. "I was just trying to enjoy it," Hedges said. "This is all about having fun. This atmosphere was unbelievable." As for Dickson, where did this rank in his brief career? "This is definitely in the top three," he said. "I'm just excited to be here and we came out and played a good game, so I'm happy we got the win." Patrick Brown is a contributor to MLB.com. This story was not subject to the approval of the National Association of Professional Baseball Leagues or its clubs.